We had a quiet weekend. I was still on the mend from my bout with flu/cold, so we laid low. Bella was excellent company during my days home sick from work. She was happy to hang out and sleep at my feet while I napped. Over the weekend, we brought Bella to meet more dogs. She took a trip to Willard Woods for her first foray on a long rope, went shopping at PetCo, and went to meet her “cousins” Ranger and Skyler at Lauren’s house. She’s getting more practice at being social. Sunday, we picked up our Thanksgiving turkey from Farmer Kim. We listened to her 5-minute Turkey College lecture. Then, we took possession of a 28-pound bird that was still gobbling on Friday. I am really excited to taste a fresh bird that has never been even flash-frozen. More on that after Thursday. 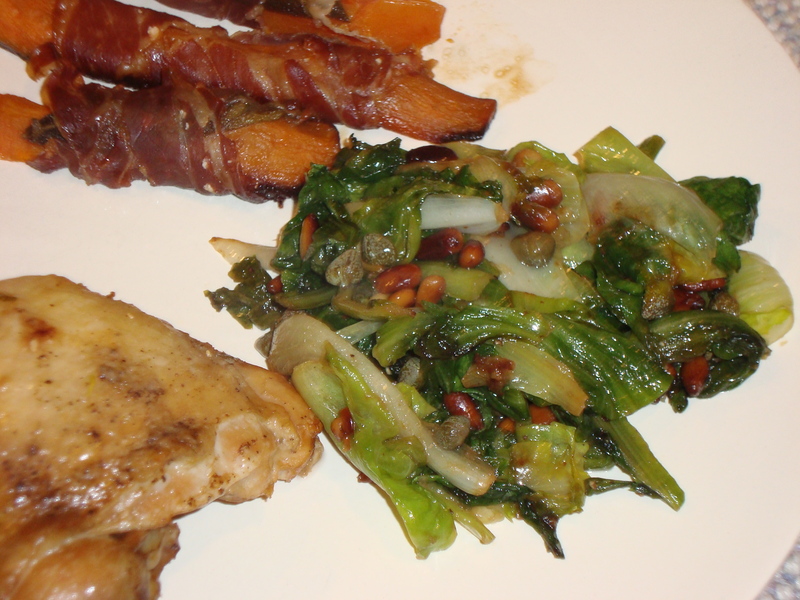 Even better than the sweet potatoes was the escarole. The escarole was packed with flavors, including several different kinds of salty. I’ll have to try these ingredients with other kinds of greens too. To prepare the escarole: Separate the leaves. Cut each leaf in half, down the center of the rib. Cut leaves across into 1-inch strips. Wash well, and dry. I used the salad spinner. Heat the oil in a large skillet over medium. Stir in pine nuts, and cook until they start to brown (it won’t take very long). Add garlic and cook another minute. Add the escarole, and turn the heat up to high. Stir until the escarole wilts and softens, about 5 minutes. Stir in the capers, anchovy paste, and vinegar. Saute for another minute, then season with salt and pepper to taste.